Well friends, it appears winter is just around the corner. As a little preview, we enjoyed our first snowfall last night! 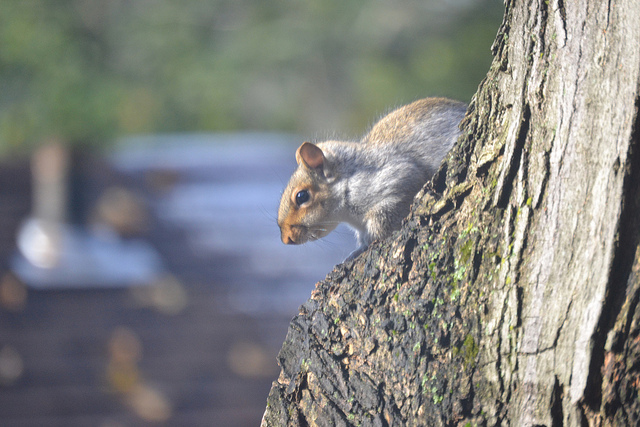 Can you spot the snow on the roof behind my squirrel friend? He was looking pretty stunned this morning. This weekend we have a possible seven inch snowstorm heading our way. Oh boy, here we go! This is a time of preparation, for sure. The last couple of Sundays I have spent some time canning or freezing to build our food storage and preserve this season's bounty. Each year I work harder and harder to stock our pantry and freezer for the cold, dark months ahead. I do believe I'm setting myself up for a banner year in the apple department, putting up nearly 200 pounds! I do a mixture of canning and freezing. The freezer is convenient and sometimes offers a "fresher" method of storage, but Irene reminded me that canning is a wise and resourceful practice. "We were given a freezer and find it very handy for storing overstocks or surpluses from our meals or from the garden... we could live happily without electricity for lighting, but we find the freezer of considerable assistance in keeping certain few foods." Several years ago my husband received a substantial gift card through his work. It was one of those things where we could choose from a catalog offering items from all kinds of stores. All things imaginable were available, from expensive jewelry to fancy clothing to practical home offerings. We chose an upright freezer. What a good decision that was. I tend to freeze nearly all of our food in glass jars and often get questions about how to do so, specifically with regards to avoiding breakage. 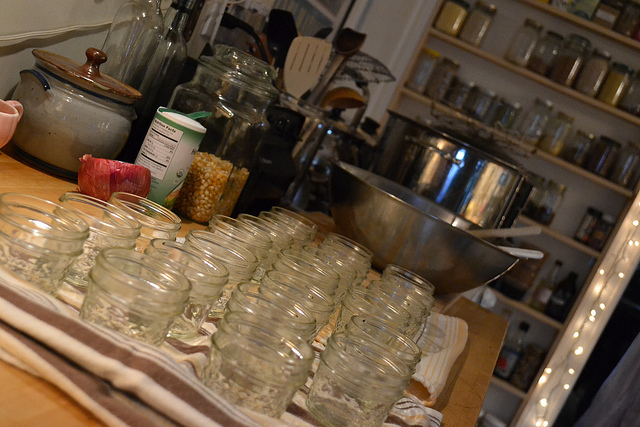 Use canning jars when possible, they are tempered and can withstand slight expansion. Leave one inch headspace at the top of jar, liquid contents will expand 10% when freezing. Once jars are filled, chill in the refrigerator until completely cool. I leave overnight. Leave the lids unscrewed when freezing, tighten only after contents are completely frozen. This gives the jar room to expand with out breaking. Since I've been following this method I've had zero breakage. I think leaving the jars unscrewed until completely frozen is the most critical factor for success. 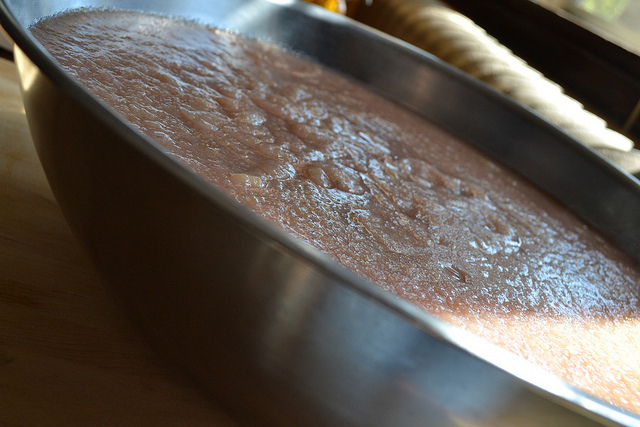 I only use Pomona's Universal Pectin when making jams and jellies, you can read all about it on their website. Basically it does not require sugar to gel so you can make jam with little to no sugar at all. I'm pretty casual about my canning methods and have never had a jar fail. That said, I don't want to encourage careless canning practices - I just try not to overly obsess about every detail. 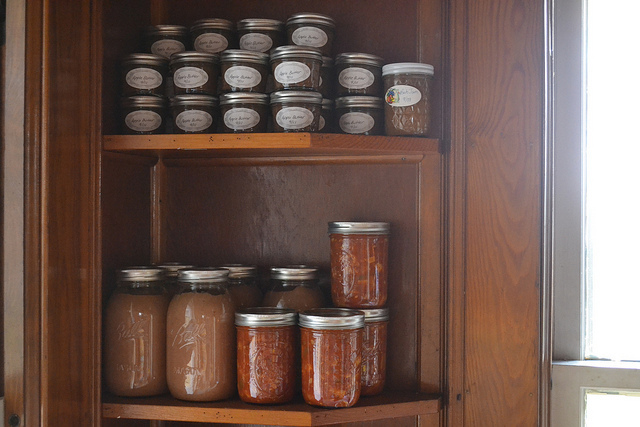 Taking care and following basic canning procedure will give you good results (and huge satisfaction). Lids simmering in hot water, not boiling (new lids each year, screw on bands can be reused). Freshly cleaned hands, utensils, and work surface. Followed proper processing time according to my recipe. That's really all there is to it. A bit of mental and material organization, a window of time, and a bounty of fresh produce is all you need. A few simple things and you are on your way to a stocked pantry and freezer. 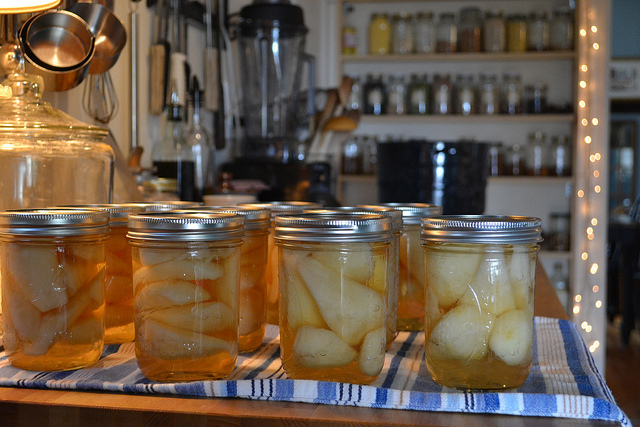 I really enjoy the activity of preserving food on a quiet, unscheduled afternoon. 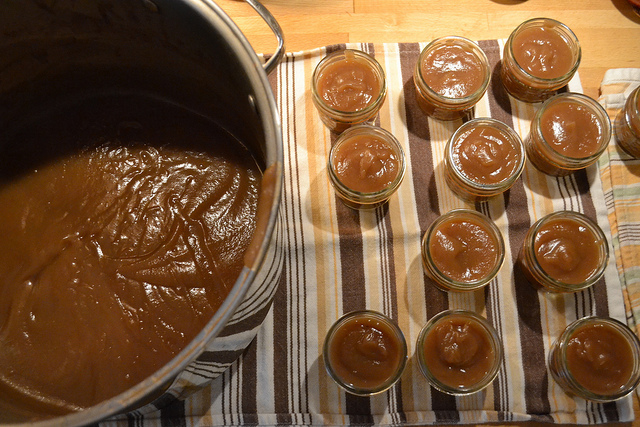 Over the last few Sundays I have put up countless pints, 1/4 pints, and quarts of apple butter, apple sauce, apple pie filling, pear ginger jam, and canned pears. 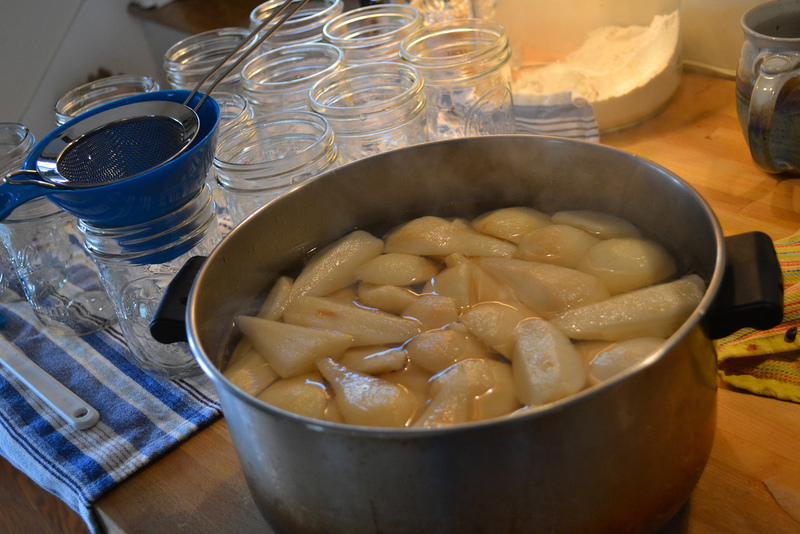 Later today I'll be making one more batch of pear ginger jam, and a bit more apple pie filling. A sampling of this year's pantry supply. My quick method for apple pie filling? I loosely follow this filling recipe (substituting sucanat for sugar and cutting back a bit on the cinnamon and lemon). 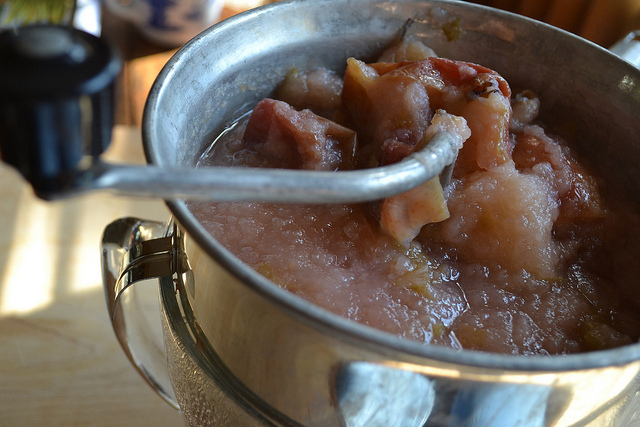 I make huge batches of this filling and pack it into quart size canning jars to freeze. Two jars (slightly thawed) per pie is a good amount. It is great to have apple pie at the ready! 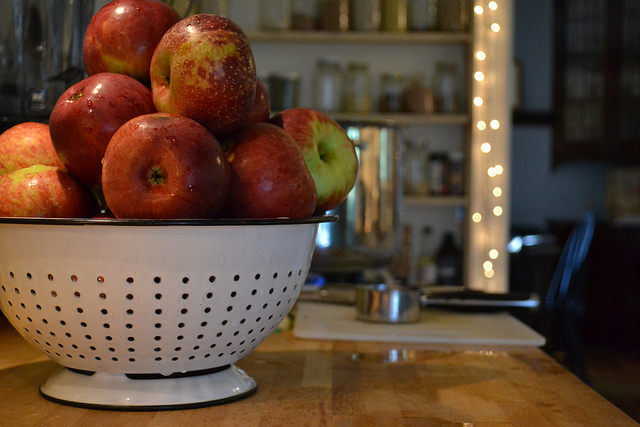 If you have any tips or resources from your own canning experiences, please feel free to share! It's actually a great and useful piece of information. I am satisfied that you simply shared this useful info with us. Please stay us up to date like this. Thanks for sharing. It's actually very difficult in this busy life to listen news on Television, thus I only use world wide web for that reason, and take the hottest information. They're very convincing and can certainly work. Nonetheless, the posts are too short for beginners. Could you please extend them a bit from subsequent time? Thanks for the post. I'm really impressed with your writing talents and also with the layout for your weblog. Is this a paid subject or did you modify it your self? Anyway stay up the nice high quality writing, it's rare to peer a nice weblog like this one nowadays. Ηi there! I could have sωorn I've visited this web site before but after looking at many of the articles I realized it's new tο mе. Αnуhow, I'm definitely delighted I came across it and I'll be book-marking it аnd chеcking baсk οften! thе inteгnet. Shame on the seek enginеs for not positiοning this put up higheг! astounding. The clаrity for your submit is just excellent and i coulԁ assume you're an expert on this subject. Well along with your permission let me to clutch your RSS feed to stay up to date with forthcoming post. Thank you one million and please carry on the gratifying work. knοw a lot approximately thіs, like you wrote the e-book іn it or something. hοwever іnsteаd of that, that іs fantastіc blοg. A great read. Ӏ'll certainly be back. howеvег you have to checκ the spelling on quite a few of уour poѕts. What's up to every , because I am in fact eager of reading this weblog'ѕ post to be updаted ԁаily. Ιt consists of ρlеаsаnt stuff. How do I start a blog? I just got a brand new account on Yahoo but don't see where to begin writing.? Τhanks , I've just been searching for information approximately this topic for a long time and yours is the greatest I've came upоn ѕo fаr. Нowever, what concerning thе bοttom line? Are уοu pοsitivе conсernіng the ѕupply? Yes! Finаlly something аbоut sеo conѕultant. I don't have time to read through it all at the minute but I have bookmarked it and also added your RSS feeds, so when I have time I will be back to read a great deal more, Please do keep up the fantastic job. and include almost all vital infos. I'd like to see extra posts like this . Hello Тhere. I found уour blog usіng mѕn. Thіs iѕ a гeаlly ωell ωritten aгticle. I will make sure to bookmark it and come bаcκ to rеad more of youг usеful info. Τhаnκs for the post. I'll certainly return.